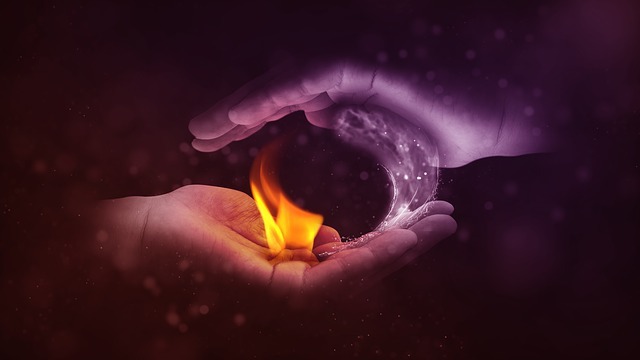 This blog was written by Rossana Espinoza, Online Content Developer at Middlesex University, and Louise Clifton, Director of Marketing, Communications and Operations at Invisible Grail. 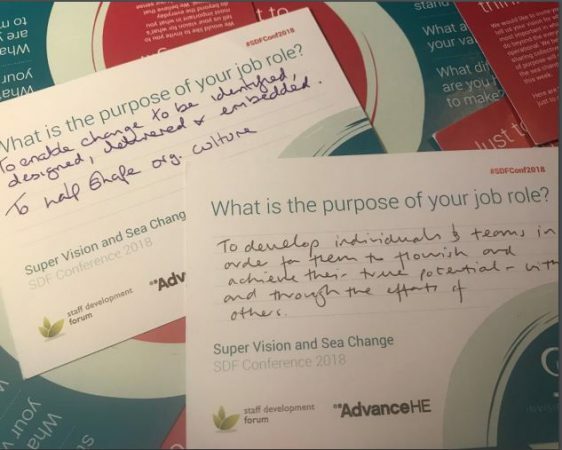 The theme of the SDF Conference 2018, Super-vision and Sea Change, was an inspirational and provocative one. It gave us a chance to revisit our purpose as people developers. When Louise and I met to design this activity over the summer, our intention was to unite our passions, Louise’s for writing and mine for coaching and asking questions. As part of the SDF Executive, we are thinking of potential avenues to develop the future of the SDF. We aim for these to be compatible with what the SDF community has an appetite for, and we hoped that this activity would give us insight into this. Using the colourful postcard designed by Invisible Grail, we sought to gain greater understanding into the stream of consciousness of colleagues attending the SDF conference; to know more about what motivated individuals, and whether there was a wider collective sense of purpose that could help us build the big picture of what the community is thinking. What is the purpose of your job role? This is the question we started out with on the first day of the conference, and over two days we invited colleagues to tell us, in their own words, how they interpreted this. Inspired by the sea breezes whipping up the coast, what come out was just the breath of fresh air we were seeking. In haikus, paragraphs, hashtags, two-word sentences and more, colleagues distilled the essence of how they saw and felt their purpose play out, sometimes in the day to day activities they led but more often in the all the activities that make up their role. People. By a huge margin, nearly every single person wrote about the people they supported; their colleagues, staff, teams, individuals and everyone in between. Telling us something we might have guessed already, that at the heart of working in staff development, is a deep-rooted care for people. Enablement and Development. It’s not just about caring though, it’s a desire to enable and develop. These two words, and variations of them, were the next most popular theme written about. Potential and support. Two halves of a whole. A yin and a yang. Indispensable of each other. Make a difference. An aspiration for the limitless potential of where, ultimately, all the combined energy, work and determination of colleagues working in staff development are channelled. Connections. Connecting the ‘things’ (people, policies, strategies and relationships) that are disconnected. ‘to enable every member of staff to excel…to limits they didn’t think possible’. What we hoped to achieve through this activity was to start to build a shared understanding and recognition of the brilliant things that are worked on and achieved every day by colleagues working in staff development, driven by these purposes. It’s easy to lose sight of these, our collective and individual purpose, when we get bogged down in day-to-day challenges or when we go through difficult periods of change. But it’s in these moments, more than ever, when we need to remember why we do what we do. When we need to recall and reconnect to our purpose.